Hello all, Mary Ellen back again. Keep an eye on our visitor counter. At 35,000 visits (wow, I’m still amazed!) we’ll have several special things for you. Prizes, tutorials, etc. What would you like to see us write more of in the future? AMQG activities, links to other sites, ramblings about nothing in particular?? Let us know–your suggestions will help me anyway, when I’m stumped for a topic. Here’s one idea I’d like to try out. I’d like us to do an online “show and share” now and then. Send me photos (my e-mail is in the roster, or you can post in your comments) of whatever you’re working on, completed projects, new tools or books, anything quilting related that we could share. Or we could have themes for each upcoming show and share here at the blog. What do you think about that? Of course some of you would have to actually share!! The first one, my photos to come soon, is going to be about scissors. Gather yours together and take a photo of your collection, or just zero in on your favorite pair. This is for all of you “cut-ups” out there! I’ll bet we could guess your generation from what “tats” means to you. Here it means ink. This is one way in which I will never be a modern quilter, but it was interesting to read how these members of the Modern Quilt Guild wanted to celebrate their quilting by getting a tattoo. For many it was not the first. Here’s the blog entry from them about the experience: click here. Happy National Quilting Day! Go buy a layer cake or a jelly roll (not the edible kind, silly) and celebrate! I have a quilt to “fix” up. I thought I was done, but whenever I looked at it I kept thinking “something isn’t right”. Friends who’ve seen it say it looks great. I think it needs more quilting. But I’m stumped as to what to add. Ever been in this predicament? I think maybe this is how many UFO’s come into our world. We get to a point in a project where something about it just isn’t right. The gorgeous colors we began with aren’t looking so great. Or the directions are unclear or even worse, incorrect! (I’m amazed at how many math mistakes in patterns go out into the publishing world.) Or we didn’t choose the value differences carefully enough. The quilting isn’t right. There are all sorts of reasons for losing our “mojo” about a project. How do we get it back so we can finish things up? Leah Day, of the Free Motion Quilting Project, deals with this from her perspective in this video. See what you think about her advice. I sometimes get myself out of a quilting rut by looking at other people’s quilts-going to a quilt show perhaps, or picking up a new quilt book or magazine. If the quilt show view does it for you, you may enjoy seeing these winning quilts from the Lancaster AQS show. I must say that what they call bed quilts, and what I call bed quilts, are very different. They must be talking about the size of the project, because I surely can’t envision any of these on someone’s bed. At least not in a house like mine where the kids and the dogs get up on the bed to nap and play! Today I’m going to play in my fabric room, making fabric poseys instead of sewing. Really fast results via hot glue and Heat and Bond are another way to get some excitement for the project going again. Sometimes what causes me to bog down is the slowness of the process, or the length of time and amount of effort it will take to “fix” a quilt project I’m unhappy with. For this one-neither is an issue. The flowers are fast to make, and if I’m not pleased they go into the garbage. Small amounts of fabric are used for each-not worth trying to salvage the petals, leaves or whatever. Just make a new one! What do you do when you get in a rut or lose your enthusiasm for a project? What’s up with this weather?! I enjoy winter but I’m ready for spring. I suppose this is our annual Buffalo St. Patrick’s Day weather roulette. Could be gorgeous, could be a blizzard-just roll the dice! Once again I’ve got a collection of odd quilty bits for you. The next post I’ve got on the drawing board will actually have a cohesive thread through it! I’ve done this technique for making a binding with a mini flange before, but haven’t seen such a well done tutorial of it. Great technique to add to your bag of tricks. She also gives some good general binding tips. click here BTW, maybe you are like me and have given up on a paid subscription to the Anderson/Tims Quilt Show online. If you subscribe to the blog or newsletter (free) you still can see many of their guests, in short snippets, and take advantage of many of their resources. If you make dolls, or incorporate faces into your quilts, you may find this tutorial for life-like faces helpful. Very clear explanations. click here. Here is a springy little wall hanging or a table topper made almost entirely from Flying Geese blocks – those easy, 3D, one-seam Flying Geese blocks! Add a few little tricks and you will have some neat-looking curved blocks and accent lines – check it out HERE! If you go back one post on my blog, you will find another fun thing – a giveaway! I am participating in current Blog Hop Party and of course besides my blog, there is over 200 others you can visit, be inspired, learn something and maybe win some goodies – hope you have fun! 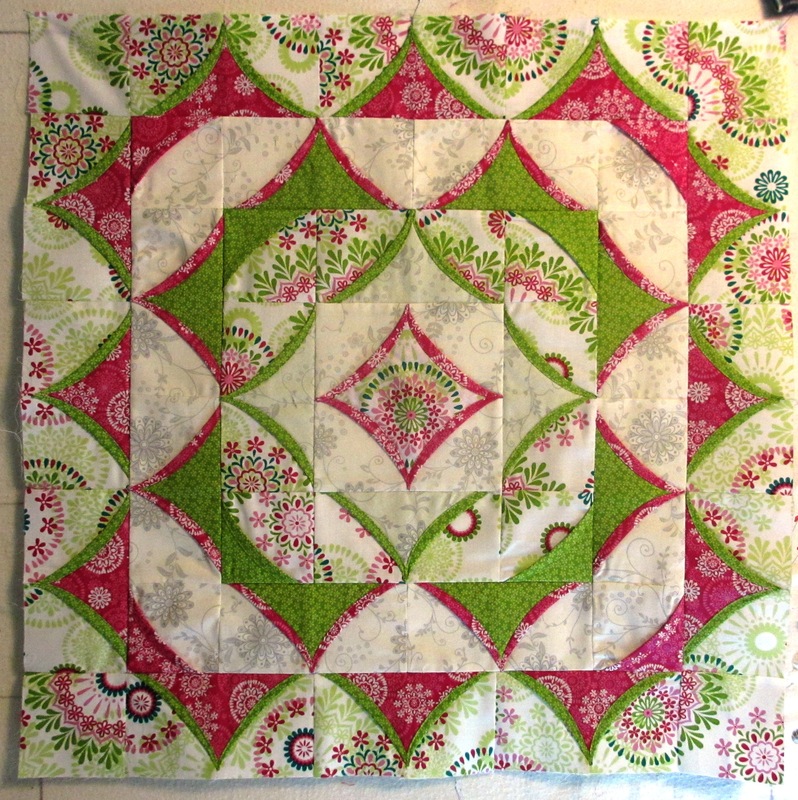 Now if that is not enough, there is yet another big “party” brewing up in cyber space – celebration of up-coming National Quilting Day (this Saturday, March 16th) that some busy folks took up a notch and declared it to be Worldwide Quilting Day! Giveaways and party there has been on-going, but I missed it before (sorry!) but you can still catch a few… Of course there is a big party going on on the day itself (Saturday), called 7 Summits Strip Quilt Challenge (remember those Jelly-roll race quilts we talked about a while ago? )- so check that out too! I know that even some local shops around here are participating in the fun – so check out on the same site, which shops around here are having special events on Saturday! (just scroll down a bit and on the right side is the list of all the shops, by state). Nothing like having some fun (shopping or sewing) with your quilting buddies to properly celebrate National Quilting Day! Me – have a very important baby shower to go to on Saturday so that is why I celebrated a bit early by doing the tutorial on my blog. 🙂 And yes…I am still finishing a baby quilt for that shower…LOL! Found another interesting article featuring Joe Cunningham – quilter we talked about few posts ago – he talks about why quilts matter, right HERE. By the way, Why Quilts Matter is a wonderful series that was aired on PBS, but I am not really sure if it was ever available here in our area – I just bought the complete DVD as soon as I heard about it and really, really loved watching it. Since I have it, of course it could be something to watch together in one of the Guild meetings? However, there is also this special Guild offer on their web site if we decide it is something we need in our Guild library? Beautiful morning today. It’s the first morning in a long while when I did not need a hat or gloves while dog walking. Sun’s out, I spotted lots of tulip and daffodils peaking through the soil. Even saw a few snow drops opening up. Definitely teasers that spring is coming. Once again I’ve got some unrelated links for you. I gave a lecture myself yesterday and spoke just briefing about designing your own quilt– Taking my class and not ending up with a quilt just like mine. Scary for some new quilters and exciting for others. The expressions on faces as I looked out to the ladies listening were varied. But I do think many of them want to make THEIR quilt, not MY quilt. So here’s to Mary Fons who pointed that out, and I promise to try to help make that happen. You’ll see why: click here. Back to the sewing machine. I’m on block 143 of 145 and I’ll soon be able to start assembling the quilt!